We work with you to deal with new product delays by identifying and exploiting your innovation constraint or leverage point. 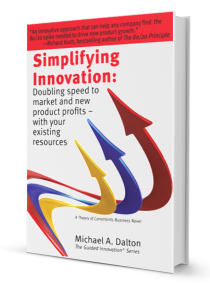 The result – Your new products generate a bigger bottom line impact in-time and in less time. What’s it like to work with Guided Innovation Group? This page tells you about the kind of results our clients have experienced; it also expands a bit on our guiding principles and philosophies, our approach to client projects, and what makes us different from most consulting firms. Impactful new opportunities making up a growing part of your pipeline. Your people will be out in the marketplace identifying unmet needs that offer the potential for real customer value. Value that ensures a promising future. A focus on the best opportunities. With an 80/20 focus, your people will be pulling together like never before. Product development teams executing projects swiftly and on time. Clear plans and customer requirement definitions guide teams like a roadmap. Underperforming projects weeded out before you invest. You’ll understand the critical assumptions, those upon which success hinges; be able to assess the realistic chances of success; and prioritize projects for maximum results. Decisive action taken to fix or stop struggling programs. Product teams will have clear plans and an understanding of feasibility. When projects aren’t tracking, everyone will know it, and the team will recommend killing the project themselves because they know there are better uses for the resources and because management doesn’t kill the messenger. Products launched to enthusiastic customer demand. Promised New Product sales volumes are commitments that teams deliver; that’s because promises are based on market value and customer requirements gathered well before development begins. Innovation is the organization-wide activity of finding and profitably serving unmet customer and market needs. Focusing on the one constraint that is most limiting your growth leverages your improvement efforts and delivers results you never thought possible. Most importantly, customer value is at the center of all innovation. Invention is about technology; innovation is about solutions. Finding unmet market needs and understanding the value that your solutions can create underpins our entire approach. If it’s not profitable, it’s doesn’t count. Creativity and invention are just a distraction if they don’t lead to commercially viable new business. And continued cost reduction is a key element of competitiveness. Measurable improvement goals and results against them are not optional. How fast do new products go from ideas to sales and what is the impact on cash flow? Our commitment is to helping you continually improve against these two goals – cycle time and throughput. Innovation isn’t just for the technology folks. It’s a team sport and the entire organization must play for maximum effectiveness. Peter Drucker said it best “Companies exist to create customers. Therefore, sales and innovation are the only value adding activities.” Of course, that doesn’t mean that other members of the company can’t add value. Just the opposite. It means that your entire organization must work together to add value in creating, cost reducing, marketing, selling, and supplying successful new products. There’s nothing magic about improving innovation. But it does require 80/20 focus, hard work, and continued commitment. If your organization can embrace our five-step approach, you can develop a repeatable process and culture of innovation improvement: a culture that will pay growth dividends for years to come. Guided Innovation works with your team using our market driven, constraints based approach so that you can expect to see results quickly. 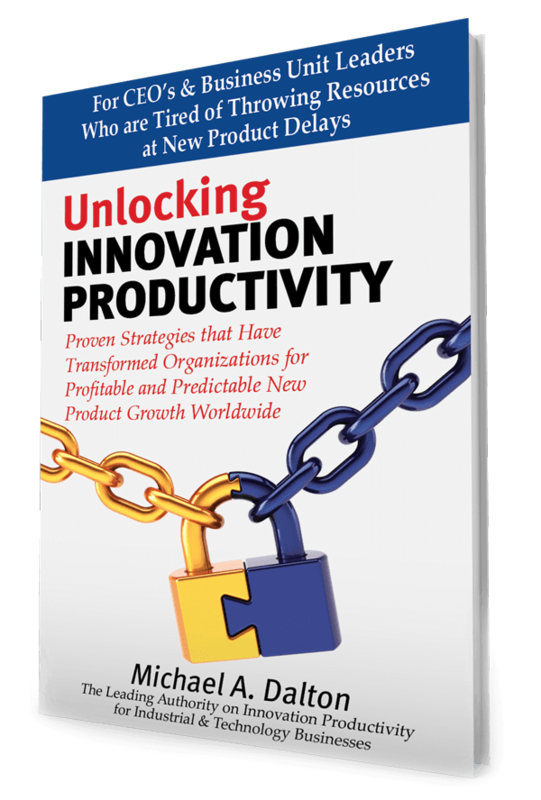 Most innovation consultants focus on generic stage gate implementation or improving creativity; but we know that innovation issues can cut across the entire organization, from sourcing to sales, and that every situation is unique. Our customized, five-step approach engages your team to identify the issues limiting your new product growth. Then using tools and methods developed over decades of real world experience, we work with the team to eliminate those constraints one by one and gradually create a deep competence in continuous innovation improvement. To learn more, download our whitepaper or executive briefing. Results are not optional. Our work is backed by an unconditional performance promise – In fact, we guarantee that if you put our five-step approach to work, you will see improvements that far outweigh your investment or we’ll work without any additional payment until you do. Not only that, but we’re even willing to base our fees on your results. That’s right. Several of our services are offered with this option: After a modest set-up fee, you don’t pay anything else until you see increased new product results. Now that you know more about how we work and the kinds of results we are committed to helping you achieve, you may be interested in learning how our services can help you get more impact from your new products.